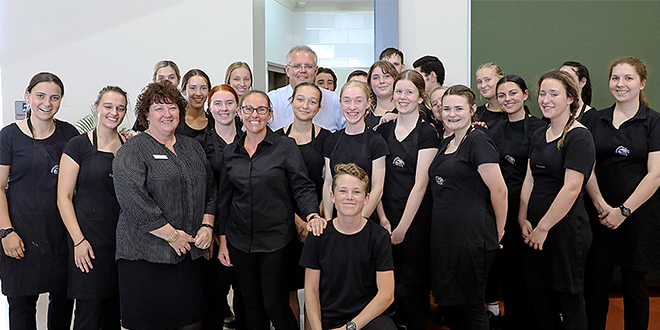 Affirmation: Prime Minister Scott Morrison had nothing but praise for Emmaus College hospitality students and staff. PRIME Minister Scott Morrison received a rousing welcome at Emmaus College when he paid a surprise visit to the Jimboomba school. The Prime Minister was there to thank volunteers in the area for the great work they did in the local community. He thanked and praised the college for its generosity in hosting him at such short notice. Following his speech, Mr Morrison went into the crowd to chat with staff and students from nearby Catholic and state schools and from local community groups. When he left the hall to visit the school’s hospitality building, he was greeted with loud cheers from students on their lunchbreak. Mr Morrison stopped to chat with the students before making his way to the kitchen to thank the budding chefs there for preparing the snacks, treats and sandwiches that fed the more than 400 guests who turned up for the special occasion. Principal Kevin Schwede said it was a privilege to have Mr Morrison visit the Prep to Year 12 college at short notice. “It was great to witness our community rally together to make it happen so quickly,” he said. Mr Schwede said guests he spoke to during and after the visit said they were impressed with the work ethic of the students preparing and serving the food. “Many mentioned how friendly they were, how efficient they were and to be so professional in their duties,” Mr Schwede said. He said staff also had to be congratulated for pulling off the enormous task at such short notice. “There was a lot of time and effort from our staff especially in supervising the students,” he said. “They supervised the ordering of the ingredients, putting the food together and then serving our guests. He said Mr Morrison also spoke about how impressed he was with the professionalism of the students. “When I was talking to him, he said it was great to be there and for the students and the community to come out in such numbers and make him feel so welcome was a real privilege,” he said. College Captain Blake White, who greeted Mr Morrison on his arrival, said it was an honour to meet the prime minister. “He was very down-to-earth,” Blake said. The Year 12 student said it was such a privilege to represent the college, “especially on occasions like this”.